Possum fore and hind foot prints in sand. The difference in prints made by fore and hind feet is evident. The forefoot prints (at left) are characteristically hand-like with widely spaced toe pad impressions. They could perhaps be confused with ferret prints, being of a similar size, but the hindfeet prints (at right) are distinctive of possum, with the short opposable thumb and the 2nd and 3rd toes fused along most of their length. Note: although possums usually place their hindfeet immediately behind the forefeet when walking, this pattern hasn't shown here, possibly because the possum was bounding. The tide had washed away the rest of the tracks. 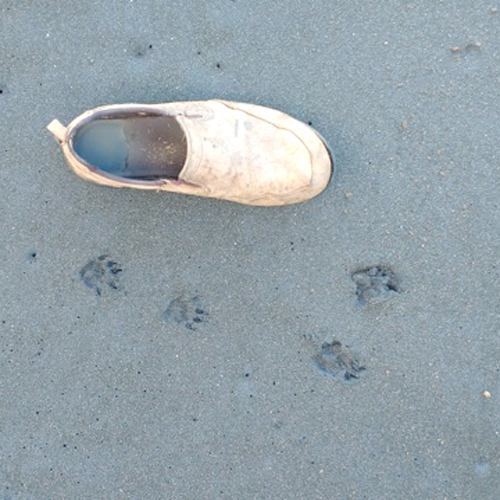 The shoe is men's size 46 for scale and the prints were found at Maukatia Bay near Muriwai.